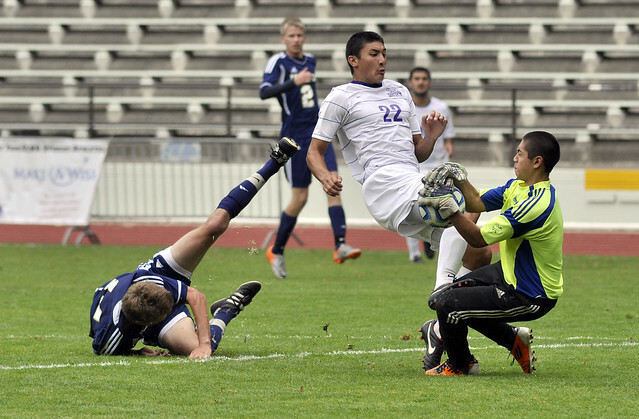 SF State Gators' Jared Magaoay (22), center, tries to score on Cal Maritime goalkeeper Kyle Carpenter, right, during the soccer game at Cox Stadium in San Francisco Sunday, Sept. 16, 2012. The Gators beat Cal Maritime 6-0, giving them their first win of the season. Photo by Godofredo Vasquez. For the Gators, Sunday’s men’s soccer game was a day of many firsts, including their first win of the season. The Gators shutout the Cal Maritime Keelhauers 6-0. Of the six SF State scorers, five Gators earned their first goal of the season within the first 45 minutes of play. Among them are freshman midfielder Sam Merritt, sophomore midfielder Robert Gilbert, senior defender Jose Vitela, freshman midfielder and forward Jared Magaoay and junior midfielder Jairo Magana. According to senior midfielder Jose Monje, who finished with two assists and four attempted shots, the team’s main strategy for the game was to keep possession of the ball, play at feet, get players open and ultimately try to get the goal. The Gators held control over most of the game, wrapping it up with a total of 42 shots, while Cal Maritime only had three shots. Despite winning this victory, the Gators are down their athlete of the week. Senior midfielder Sasha Chalak twisted his ankle after getting caught with a Cal Maritime player 18 minutes into the game. The Gators are gearing up for their conference game home opener Sept. 21 against Cal State San Bernardino at 12:30 p.m.